In the past, I have shared 2019 React Developer RoadMap and some free courses to learn React, which helped a lot of my friends and readers and they asked me to also make a list of best React courses. So, I will share some of the most popular courses to learn to React and Redux framework to make the user interface development easier. If you are a front-end developer you can use these courses to further enhance your skill and if you are a back-end developer than also you can join this course to learn React JS. If you are thinking about why one should learn React library, I think knowledge of popular front-end libraries like Angular and React is important for programmers who want to become a full-stack developer and nowadays full-stack developers are in good demand. So, learning React will also improve your chances of getting a job as the web developer. Btw, if you are in rush and don't want to go through the full list, you can always start with the React 16 - The Complete Guide by Max on Udemy. This is one of the best course to learn React and I am also learning from the same course. If you are wondering should I learn to React now or later then let me tell you that there is no better time to learn React than now as companies like Facebook, Walmart, Uber, Airbnb, and Netflix are all using React in production. Since everyone’s using React right now, from big to small companies, the demand for React JS developers is very high and more and React jobs are popping up every day. The course covers most of the React and Redux fundamental concepts like fundamentals of React, JSX (React's custom markup language), "props", "state", eventing etc and also touch new topics like ES 6 and advanced concepts like Babel and WebPack, which are important for full-stack web developers. You will also learn about writing clean code using JSX and testing your React application, which is very important for a professional web developer. He also keeps his course up-to-date. In short, a highly recommended course for both React beginners and intermediate developers. I am a big fan of Maximilian Schwarzmüller and he is probably the best instructor out there in Udemy or another online tutorial website for Angular and ReactJS. His courses are simply awesome and he explains everything in such a way that you will understand the even complex concept without making a sweat. On top of that, he is very hands-on and he builds his applications and examples from scratch, explaining every single thing he is doing, which makes it easy to follow instructors and learn along. Like previous React course, this one also covers all important React fundamentals like building components and leveraging it to build complex GUI. IT also touch base on React for managing state and how to use Redux along with React JS. The course is also very comprehensive with more than 33.5 hours of material. You will start with fundamentals then learn to code in React, followed-up by testing and debugging your React application. In short, a complete guide to learning ReactJS in 2018. Highly Recommended !! 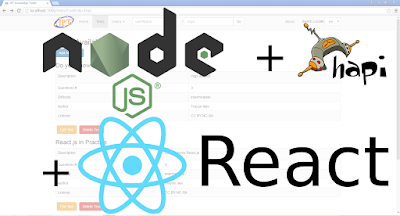 This is another awesome course on Udemy to learn how to build and launch React web applications using React v16, Redux, Webpack, React-Router v4, and related technology. The Complete React Web Developer Course 2 starts with the React fundamentals like components, JSX etc and covers everything you’ll need to build and launch React web apps. You’ll learn what it takes to build and launch a React app, from the first line of code to the final production deployment. yes, the course is truly hands-on and you will learn to React not by watching but by doing. It also has programming challenges and exercises which are designed to test and reinforce whatever you have learned. You will also build two real-world React web apps Indecision, a decision making an app and an expense manager called Budget. These apps have all the features you’d expect from a real-world application including authentication, user accounts, routing, testing, form validation, database storage, and more. These development exercises will provide you with valuable experience, which you need to clear any React interview. The author Andrew Mead is a full-stack developer and a great teacher which has in-depth knowledge of the subject he teaches. This course is truly awesome and hands-on and I highly recommend this to all the programmer who wants to become a professional web developer using React. This course is designed around one goal: turning you into a professional React developer capable of developing, testing, and deploying real-world production applications and it has lived up with its promise. 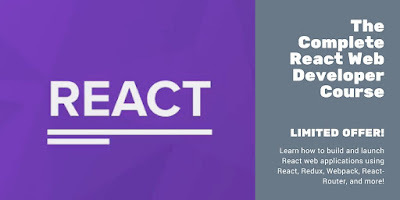 This is another awesome course from Stephen Grider on React and Redux. In this course, Stephen provides detailed walkthroughs on advanced React and Redux concepts like Authentication, Testing, Middlewares, HOC's, and Deployment. You will learn how to build a scalable API with authentication using Express, Mongo, and Passport and learn the differences between cookie-based and token-based authentication. You will also figure out what a Higher Order Component and how to use it to write dramatically less code and learn to set up your own testing environment with Mocha and Chai. In short, an advanced level React and Redux courses which you can use along with the first React course mentioned in this article to become a complete React developer. This is one of the best course to learn React library on Pluarlsight. The instructor Samer Buna is a software developer, technologist, and product delivery expert and done a wonderful job explaining React concepts to beginners. This course covers all the features offered by React JS and explains their advantages and disadvantages relative to the other popular options available e.g. 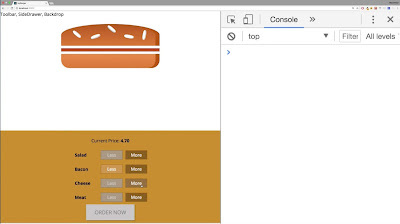 Angular or Vue JS. 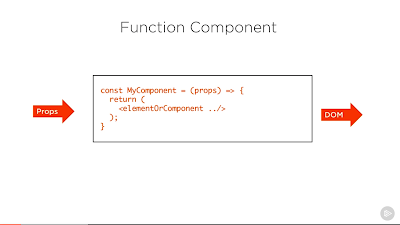 It also discusses some of the important topics like React's one-way reactive data flow, the virtual DOM, and JSX syntax for describing markup. Btw, you need a Pluarlsight membership to access this course. If you are already a member then just join this course but if you are not then you can become a Pluarlsight member by option for a monthly subscription of $29 a month or a yearly subscription of $299 per year. This gives you access to more than 5000+ high-quality courses to learn the latest technologies. If you don't want to commit, you can also try this course by signing up for the 10-day free trial on Pluralsight which provides you 200 minutes access to all its courses, including this one. 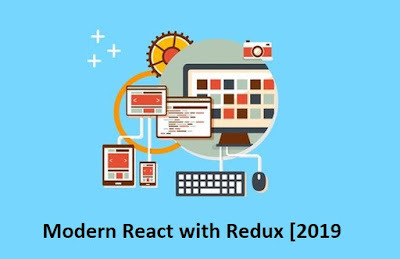 That's all about some of the best courses to learn React and Redux framework for modern web development. If you are looking to build your own website or looking for a job in the web development space, these courses will help you a lot. Thanks for reading this article so far. If you like these online React and Redux courses then please share with your friends and colleagues. If you have any questions or feedback then please drop a note.